Bladewise is an American smasher located in the Washington state, known for being one of the best Melee Peach mains in the USA along with lloD and Kalamazhu. 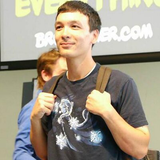 He is a major competitor in Washington tournaments, and has made decent impacts at large nationals, such as Apex 2013, EVO 2013, Apex 2015, EVO 2016 and The Big House 6. He is currently ranked 1st on the Washington Melee Power Rankings and 44th on the 2018 MPGR. FD ONRY October 7th, 2006 3rd 1st R.C. This page was last edited on March 29, 2019, at 15:55.